Get Our Best Strategies For Growing Leads & Sales! 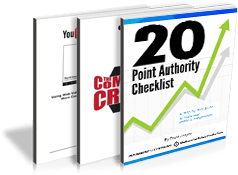 This PDF contains a quick audit you can use for your website. Ensure you’re following Google’s best practise and improve your rankings, traffic and conversions. This PDF contains a step-by-step online marketing plan any website owner (you) can apply. From website usability, email, video and social media marketing – you’ll discover best practice in this highly useful internet marketing course. This PDF contains the simple 4 step process you can follow to get the most from web video. The fact is, every website needs web video that works!